For the past decade, fundraising professionals have been able to perform wealth screening, or automated electronic screening, on their US prospects to segment their database and prioritize top potential donors. For Canadian based prospects, it is a very different situation. 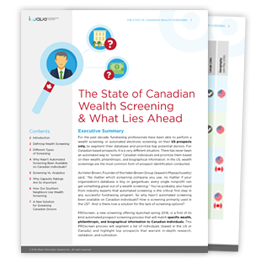 "screen" Canadian individuals and prioritize them based on their wealth, philanthropic, and biographical information. And is there now a solution for the lack of screening options?